Previously, we reported that Cyberconnect2 were working on three new games in the ‘Trilogy of Vengeance‘ for Nintendo Switch. From now until November 15, the company is hosting a contest for fans to submit their own storyboards with the theme of ‘vengeance’. 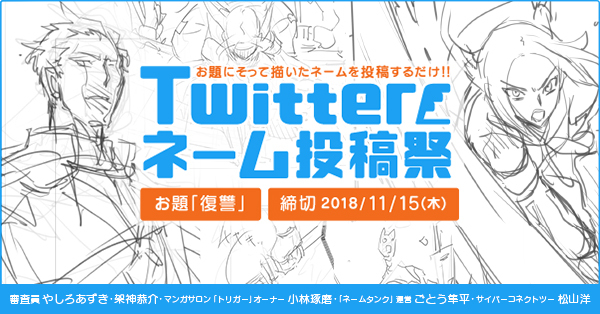 Anyone can tweet a storyboard with the tags #復讐三部作 and #復讐マンガ」をつけて to become eligible. You can use characters appearing in the “Trilogy of Vengeance”. Please draw the title, frame rate, serif and character clearly. Character rough drafts, single-frame cartoons, only the story’s opening, or only the story’s climax are all acceptable. There is no limit on the number of pages. Please be sure to fill in the page number on the manuscript. Each person can only submit one storyboard each. The first prize winner will receive the ‘Hiroshi Matsuyama Award’ of 100,000 yen, along with other consolation prizes for the runner-ups. CyberConnect2 will announce winners in December 2018.